Is this the uncle of the year? 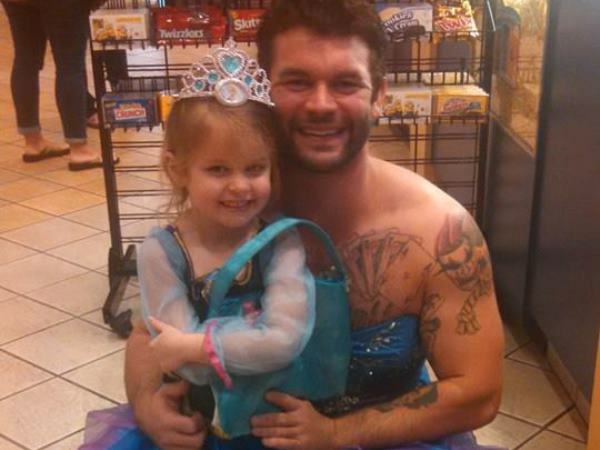 A bearded and heavily tattooed man decided to dress up as a princess so his 4-year-old niece wouldn’t feel self-conscious on their trip to the movies. Jesse Nagy, from Alabama, USA, took it in his stride to build little Izzy’s confidence when she told him she was too shy to wear her princess costume to see the movie Cinderella. “Sometimes you have to be a princess,” posted Jesse on his Facebook page. The dress is reportedly a prom outfit he borrowed from a friend. Izzy helped seal the look with a tiara and pink bag from her own collection.